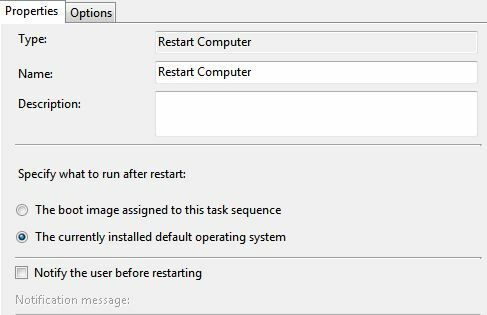 During a recent project to roll out Windows Updates using System Center Configuration Manger 2007 R2 (SCCM) I wanted to deploy updates to a user group. Unfortunately, SCCM will only deploy Windows Updates to a collection that contains computers, not users. I used the code below to create a SCCM collection that contains the computer that was last logged onto by a member of a given Active Directory group. To use the code follow the steps below. Click on the button highlighted in yellow bellow. Paste in the code replacing the domain and group name with your own. Click OK and finish the wizard. This entry was posted in System Center Configuration Manger on March 14, 2012 by richardstk. 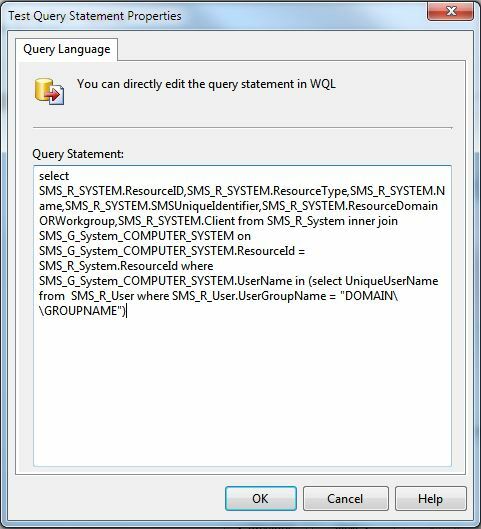 If you need a list of System Center Configuration Manager (SCCM) collections with maintenance windows, run this query against the SCCM site database using SQL Server Management Studio. This entry was posted in System Center Configuration Manger on March 7, 2012 by richardstk. If you need to install an update or some software, but are told you cannot because of a pending file rename, first of all reboot the PC or server. If this fails you can force the install by renaming the “PendingFileRenameOperations” registry key at HKLM\SYSTEM\CurrentControlSet\Control\Session Manager. Just rename the key to something like “PendingFileRenameOperationsOLD” and your update should install. This entry was posted in General on March 7, 2012 by richardstk. 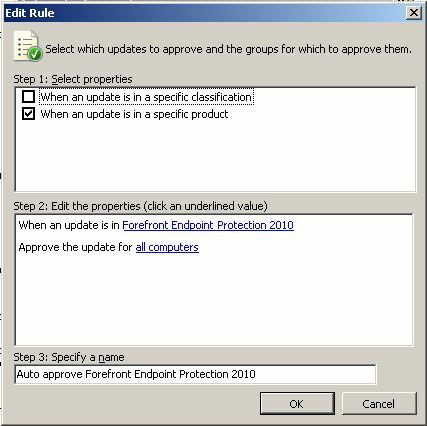 These are brief notes on how configure ForeFront Endpoint Protection (FEP) 2010 to work with System Center Configuration Manager (SCCM) 2007 R2 and set the FEP client to receive definition updates from the SCCM server. Install FEP on the server. I chose a Basic installation as I wanted all components to install on to the SCCM server. 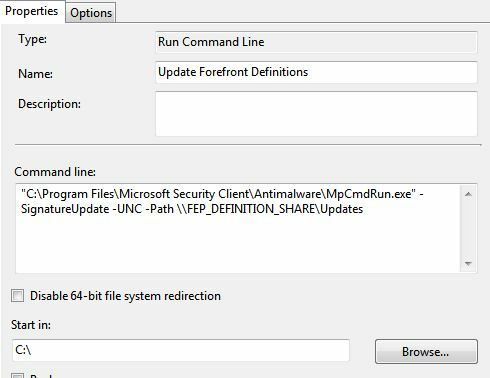 Follow the instructions at the link above under the section “How to Configure Configuration Manager for Forefront Endpoint Protection Update and Create Deployment Package and Assignment” This creates a Deployment Package and Assignment to install the FEP definition updates. To schedule the update of the FEP definition package with the latest definitions follow the instructions under the section “How to Use Definition Update Automation Tool with Task Scheduler”. As I configured the FEP updates to be controlled by SCCM, when the FEP client is first installed the icon turns red because the definitions are out of date. If you leave the client, it will eventually have the latest definitions pushed to it by SCCM. However, I wanted to have protection from installation. 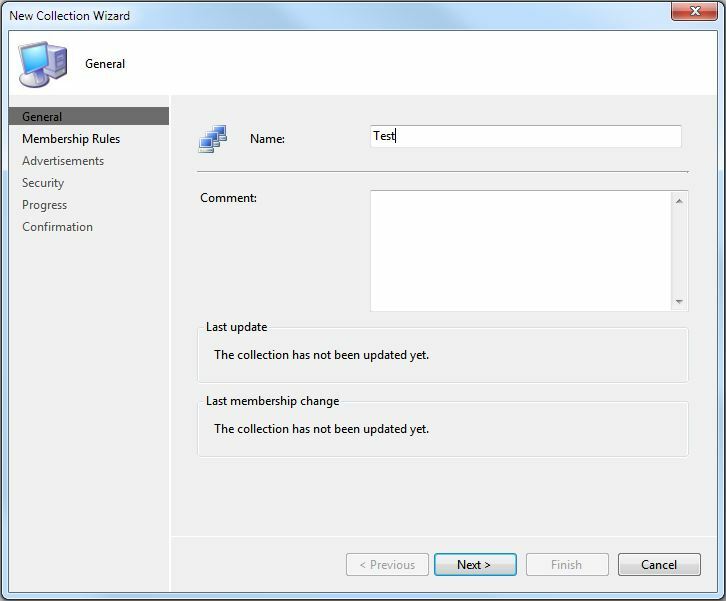 In order to get this working I enabled automatic approval of the FEP updates within WSUS. Using the FEP policy you’re able to tell FEP to go to WSUS for updates if the definitions are older than x days. To configure WSUS, open the WSUS console from Administrative Tools and navigate to Options. 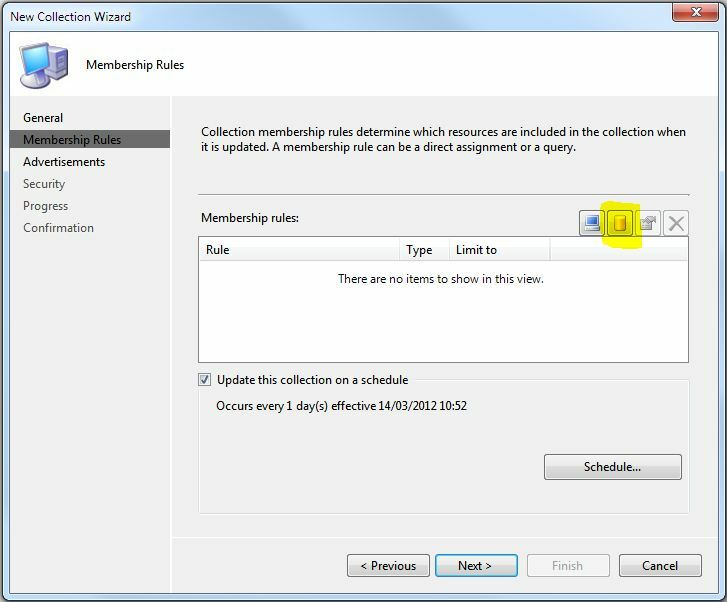 Open Automatic Approvals, click New Rule and configure it as below. 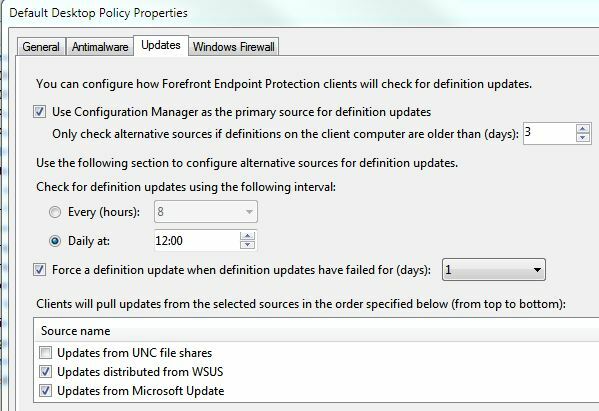 WSUS will now automatically download FEP updates and they’ll be available to FEP clients via the policy. Next, add a Command Line step. 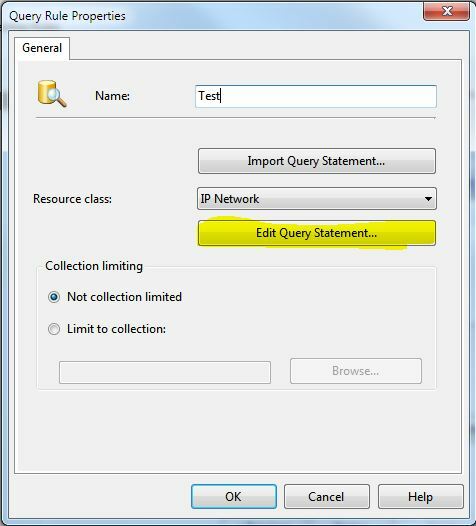 Update the share path to match the location of the FEP definitions in your environment. This will run a manual definition update from the file share.